Yesterday I was gardening, mostly pulling weeds and moving a few plants so that I could lay down a barrier and cover it with mulch. I was enjoying the warmth of the day, even the salty sweat that stung my eyes. I was moving a bag of mulch from the upper level of the front garden to the lower and that is when I felt the weight of the rock. It had been pulled off hidden under the bag to fall on my little toe. I remembered thinking that I was so thankful that this rock had not hit my leg as it is one of the few that with jagged edges and could have done considerably more damage on my bare lower legs than smashing a toe protected by my shoe. I went on working a bit longer, which is really odd for me because I have many stories of how smashed toes and fingers--or any injury, really--gives me only about one to two minutes of clear thinking before I start going into shock and have to lie down. It is embarrassing, but that is how it usually works with me. This time, however, I began praying immediately and continued working. Then it occurred to me that the odd combination of numbness and pain from my toe was reminiscent of when I had fractured it once before, so I took a look. Yeah, it was swelling and I could bend it, but it would cause a stinging twinge so I am pretty sure I fractured that same toe again. But that was not the worse part as I have lots of alternative health secrets, so that the toe was only slightly swollen and discolored 20 minutes later. The worse part was that, when the rock hit my foot, I apparently wrenched my back in just the right way that it caused one of my rib heads to slip out of place. I have been very fortunate that it has been over a year since the last time have had a rib head subluxation, Feeling Stabbed in the Back, for they used to happen to me a few times a year and if you read that older post, you will better understand the miracle that I am about to describe. The injury happened on Saturday near 5:00 pm when no chiropractor I know has his office open. The thing is that if I do not get the rib head in immediately, the muscle spasms will make it impossible to do so in a very short time. I was already beginning to have the sore tightness that wraps along the entire rib to the front and is felt with every breath. I did call our local chiropractor as he will come in for an emergency like this, but not only was the office closed, but he was out of town until Monday. I knew that meant that I would be so bad by then that I would not be able to lie down or drive. It also meant it would take me at least three days to a week to recuperate due to the inflammation and soreness caused by the spasms even with all my alternative health tricks. I thought about people who had slipped rib heads and did not even have the option of chiropractic or medical care presently and throughout the ages. How did they and do they do it? Then I prayed and left it to my Lord, and I felt that he told me to go back to what I was doing as if it never happened. If you knew what a low threshold I have for pain, you might understand how difficult that would have been for me, but that is what I did. I put my shoes back on and went outside to do more gardening for about an hour. It actually kept me from getting too tight, but I felt the pull with each movement. The rib was still maligned when I showered and then rested. It was tightening and I was praying. Then I was given a solution. You see, many times a rib head slips toward the back or posterior and one can use a tennis ball to roll against on a wall to gently work the rib head back in place, but usually when I slip a rib head it goes anterior so the ball thing can make it worse. I just wanted you to understand that the solution my Lord gave me was not one I would have thought would work. I used soft weights on the sides of the spine while I lay on my back to sleep last night. It really should not have worked and when I tried something like that before it made me worse. Lying that way was uncomfortable, but it is when I am lying down that the whole thing worsens to the point I can hardly get out of bed in the morning so I would have been uncomfortable anyway. This morning I was a bit tight and sore, but not as bad as I know I should have been. I even sat in church, which usually makes it worse, but I was fine. This evening as I write this my back is pain free. Now, what I have always known is that my Lord heals and can heal us in the most miraculous ways, but not all miracles come in the form of immediate healing. I felt that my Lord was trying to tell me that throughout the centuries, He has guided, directed, and given people knowledge to do certain things to heal themselves or others as well as healed them miraculously. Then, He reminded me that I obeyed Him against my nature and went back out to work even when I felt no evidence that He even was going to heal me. I just did what He told me to do and then He just did what I had asked Him to do. My toe is going to heal very quickly as well. It looks like the injury happened two weeks ago already and is not throbbing at all when I walk, although it is a bit sore when I walk on it. That will pass soon too. 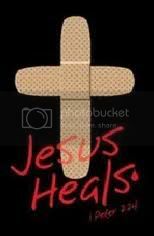 My Lord is my healer.